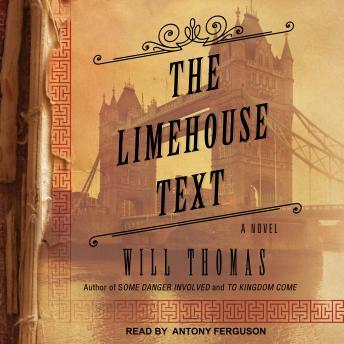 In The Limehouse Text, Cyrus Barker and Thomas Llewelyn discover a pawn ticket among the effects of Barker's late assistant, leading them to London's Chinese district, Limehouse. There they retrieve an innocent-looking book that proves to be a rare and secret text stolen from a Nanking monastery, containing lethal martial arts techniques forbidden to the West. With the political situation between the British Empire and Imperial China already unstable, the duo must not only track down a killer intent upon gaining the secret knowledge but also safeguard the text from a snarl of suspects with conflicting interests. Prowling through an underworld of opium dens, back-room blood sports, and sailors' penny hangs while avoiding the wrath of the district's powerful warlord, Mr. K'ing, Barker and Llewelyn take listeners on a perilous tour through the mean streets of turn-of-the-century London.